In this video we introduce the new Nerf Elite Series 18 round clip system magazine, and examine what it has to offer over its predecessor: the original 18 round magazine included with the Nerf Stampede. Externally the two are nearly identical, and as you would imagine are interchangeable in their compatibility with both old and new Nerf Clip System blasters. The primary noticeable difference is that Nerf has replaced one side of the Elite Series magazine with a translucent orange plastic, as compared to the opaque plastic of previous models. The advantage is immediately apparent in that it allows a user to easily identify when they are running low on ammunition. 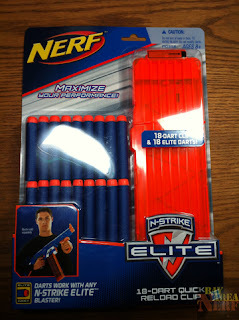 With a glance, one can see exactly how many darts remain, even during the most heated of firefights. While still a vast improvement, we couldn't help but notice an interesting design choice: when shouldering a vertically fed blaster on the right side of the body, the clear plastic half of the magazine is actually located on the right side of the blaster--outside the user's line of sight. As most users are right-handed, this will present a minor inconvenience. More interesting still is that side-loading blasters like the Raider or Rampage will have the clear portion of the magazine facing straight down. Both of these are less than optimal, and will require users to turn and flip their blasters at odd angles in order to view the contents. Again, this still provides a significant advantage over the small viewing slits in the previous fully opaque models, but we feel it isn't quite realizing its full potential. Internally we were able to identify a more subtle, yet still very important difference. 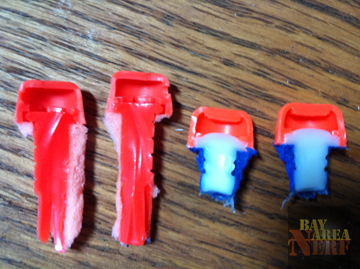 Inside the bottom portion of the magazine is the addition of four small plastic tabs. 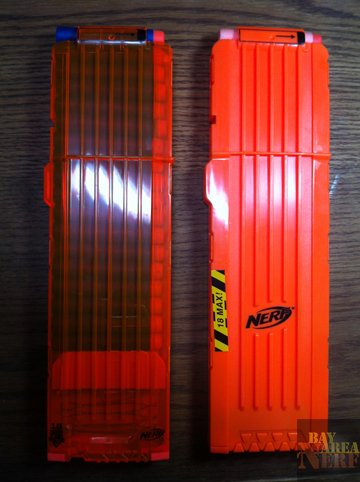 These tabs stop the spring-loaded dart feeding mechanism from advancing any further into the magazine. 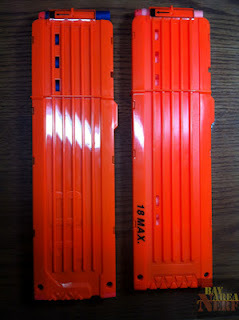 The end result is that the new Elite Series magazines have a maximum capacity of exactly 18 darts and no more. This is actually a good thing, as it eliminates any possibility of overloading. Previous clip system magazines easily accommodate an extra one or two darts and, unless you count, it's very easy to accidentally overfeed them. This leads to excessive compression of the darts, shortening their overall life span as well as deforming them and increasing the likelihood of jams and double feeds. With the new design this is impossible, allowing players to fill their magazines quickly and with confidence. We think this is ideal, and certainly worth the tradeoff in capacity. Lastly, we looked at the darts themselves, and found some very interesting differences. Outwardly the new Elite Series streamline darts resemble the original streamlines in every way, with no obvious differences in the quality or construction of the darts themselves. The foam body of a brand new Elite streamline feels identical to the foam of a brand new original streamline, and the only physical characteristic that differentiates them is a slight increase in resistance to compression of the dart head. However, dissection and subsequent weighing reveals some noteworthy points of interest. First, the overall weight of the darts differs by a significant margin. The original streamline darts weigh in at 1.34g, while the Elite streamline darts are relatively lighter at 0.99g. This is a difference of 0.35g, making the Elite streamlines approximately 25% lighter overall. Cutting the darts open and separating the head from the shaft, we found that the foam bodies of the original and Elite streamlines are nearly identical, weighing in at 0.3g and 0.25g respectively. The real difference shows in the weights of the dart heads; the tip of the original coming in at a whopping 1.04g, next to the comparatively much lighter Elite dart tip at 0.74g. This is a variance of 0.3g, which accounts for most of the overall difference in the weights of the darts themselves. Finally, and perhaps most significant of all, is the actual distribution of all that extra weight throughout the body of the dart. As you can see in the image below, the head of the original streamline dart is about twice as long as the Elite dart head; the tail extends an extra 1.5cm into the dart. We don't know exactly how these factors will add up to affect performance, but between this shift in weight distribution and a lighter weight overall, we could expect to potentially see some differences in both range and flight dynamics, particularly with the more powerful Elite Series blasters.